This page is still under construction - Read Carefully! Soil Critters - What are they? Wireworms are the larvae (immature stage) of the click beetle. Earthworms are reddish looking, long and skinny. They live in the soil, eating little pieces of dead plants and insects, like dead leaves, old bark, dead roots, old insect shells, and lots of other tasty soil stuff. They tunnel through the ground looking for something to eat. While they are doing this, they make holes in the ground that let water and air into the soil. This really helps plants to grow. 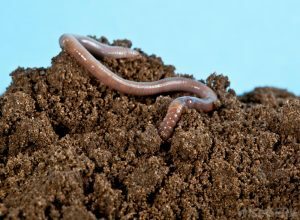 Here are some pictures of earthworms and a short video showing how they move through the soil. 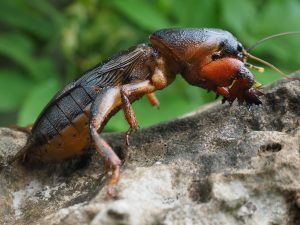 What is a mole cricket? The mole cricket gets his name from his mole looking appearance. He is a brown insect with small eyes and shovel-like forelimbs. These forelimbs, which are great for digging, help them create burrowing tunnels in the soil underground where they spend most of their time. These insects can grow up to an inch and a half and their bodies are covered with fine hair that gives them a soft, velvety appearance. They are mainly active at night and do quite a lot of damage to lawns as they burrow and feed on the root system of the lawn. Nematodes are a kind of worm. Most of them are very small – it takes a microscope to see them! Scientists call them and their close relatives “roundworms”. Some nematodes eat plant roots, and some nematodes eat other nematodes. But most nematodes just live in the soil and make plants grow better – just by being there – part of what we call the soil foodweb. 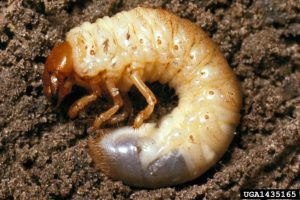 Grubs are chubby, worm-looking larvae of something called the Scarab Beetle. A larvae is sort of a baby or younger form of some kind of an insect. We usually see them when we dig up some dirt in the lawn or the garden. If there are a lot of them in one area, they can kill plants by eating the roots. If your lawn starts having patches of dead grass, dig up some dirt and take a look. You might find a bunch of grubs! Fire Ants are small ants that can really hurt if they sting you. They live in holes in the ground in groups called colonies. When the ground is wet (like after a big rain) they make big mounds of loose dirt to live in. There are different kinds of fire ants. The ones that quickly swarm all over you and start stinging when you step on a mound are the “imported fire ants”. They came to the United States from South America. 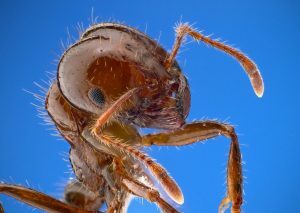 There are also some in the United States that sting you kind pretty hard, but don’t swarm on you very quickly – those are called “Native Fire Ants”. They usually have smaller mounds also. Harvester Ants are red or reddish brown and about 3/8 inch long. They mostly live in areas where it is dry most of the time – like the desert. You can easily tell what kind of ant they are because they make a big bare circle where their hole is. They have a painful sting, but if you don’t mess around with them, they usually don’t sting you. Read more about Harvester Ants. 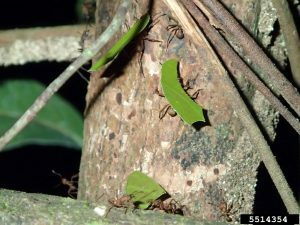 What is a Leafcutter Ant? Leafcutter ants are verrry unusual. Their name fits them well, because they certainly do cut leaves. In fact, they sometimes cut all of the leaves off of a tree in one night! They carry them all the way back down the tree to their hole. They like working at night, so you rarely see them in the daytime. You might wonder what they do with all those leaves. Well, they don’t eat them – they take them underground and use them for fertilizer. Yes, these ants are actually farmers! And what do these ant farmers grow? Fungus! Sort of like a mushroom. And then they eat it and feed some parts of it to their babies. They have to grow a lot of this fungus, because they live in big ant cities called colonies. Some of their colonies have 2 million ants! That a lot of fungus. Like I said earlier, leafcutter ants are verrry unusual. What is a Rasberry Crazy Ant? Rasberry Crazy Ants are named this because they were first identified in Texas by Tom Rasberry. Mr. Rasberry had a pest control and was called by a customer to get rid of big ant colony. When he got there he found a type of ant he had never seen before. These ants moved around really fast and they changed directions every second or two. And it seemed like they never got tired of all that running at full speed. Tom Rasberry started telling a lot of people about them. He called them Crazy Ants. Pretty soon everybody started calling them Rasberry Crazy Ants. 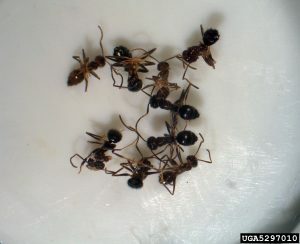 They are also called tawny Crazy Ants. What is a Root Aphid? Aphids are a kind of bug that likes to drink the sap out of plants. You usually find them on the underside of leaves. Ladybugs like to eat them. But there is a special kind of aphid that lives in the soil and eats the roots of plants. It is called a root aphid. They are light colored (yellow, green, or brown) and very small – smaller than a grain of rice. They can kill plants if a lot of them are on the roots at one time. A slug is pretty much a snail that doesn’t have a shell. They are gooey and sticky if you touch them. When they crawl across the ground they leave a sticky trail of goo. They need a lot of moisture to keep all their goo going, so you don’t usually see them on a hot, dry day. In fact, most of them live in areas where it rains a lot most of the year. They mainly live underground, but sometimes you can see them under plant leaves. They can eat a lot of vegetables in the garden if there are very many of them. One way you can get rid of them is if you put salt on them. Salt makes them dry out and that kills them. 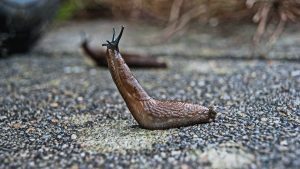 If you want to know more about slugs, look here. Grasshoppers are pretty big insects. The smaller ones are about 1/2 inch long, but some of the bigger ones can be 4 or 5 inches long! They have powerful back legs and can jump long distances. When they want to communicate, they sometimes rub their back legs to make different noises. In fact, it is said that many tragic grasshopper accidents occur when they try to jump and talk at the same time. 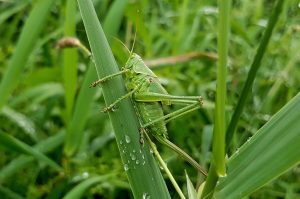 Grasshoppers eat mainly plants, but sometimes they eat other grasshoppers (if they are really hungry). They lay their eggs underground, that’s why they qualify as soil critters. Click here for more about grasshoppers. 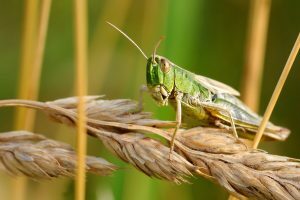 Locusts are similar to grasshoppers, but they have a special trick that makes them a real pest. Sometimes a lot of them hatch from eggs about the same time and then they all get together into a swarm. A locust swarm can be several miles wide! There can be billions of them in a swarm. They usually are only an inch or two long, but they can eat as much as they weigh EVERY DAY! When they swarm and start flying, sometimes they look like a huge thunderstorm. There are so many of them in a swarm that they can eat most of the plants in an area when they come through. This sometimes causes people to lose all of their crops and creates a famine, where people don’t have enough to eat for awhile. Click here for more about locusts. Fleas are very small insects. They are good jumpers and they like to live on animals because they are bloodsuckers! Yes, you heard that right – they live on animal blood, including human blood. And when they bite you to get your blood you know, because it really itches. Fleas are the many reason dogs are always scratching themselves. Fleas are soil critters when the mama fleas lay their eggs outside, which is most of the time. The eggs hatch and the baby fleas crawl around in the top of the dirt eating whatever they can find. When they finally grow up they look for warm blood to eat. Fleas are not my favorite insect. But if you want to find out more about them, check here. What is an antlion (or doodlebug)? 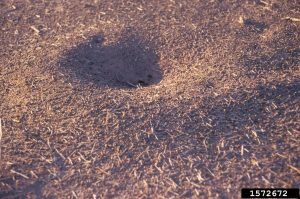 Antlions are the kid form (larvae) of an insect that looks like a small, weak dragonfly when it grows up. In the US the larvae are often called doodlebugs. They are pretty small when they are larvae, less than half an inch long. When they get big enough, they crawl to a dry area of bare dirt. Then they start digging a hole by flipping the dirt away. Pretty soon they have a small cone shaped hole, with steep soft sides. That is where their name comes from, because this hole is an ant trap. The doodlebug digs down in the bottom of its hole to hide and wait. When an ant falls in the hole the doodlebug grabs it with its pinchers and hangs on. The ant tries to crawl out, but has a hard time getting away because of the steep soft sides of the hole. Eventually the ant either gets away or gets tired out and the antlion eats it up! Then the antlion flips the body of the ant out and starts repairing its hole – waiting for the next unlucky ant to come along! 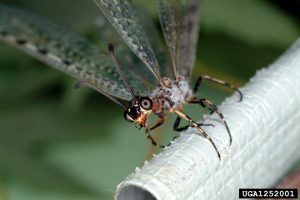 To learn more about the fierce antlion kid or the dainty antlion adult, click here.